T-shirts are an awesome way to get your brand out there from a marketing standpoint. One unique way to do this is through a live screen printing event. We teamed up with our good friends at Shirt Agency to learn more about how to host one. So keep reading this guest post where Cole will break down everything you need to know! Want to know how to expand your business’ reach and party at the same time? 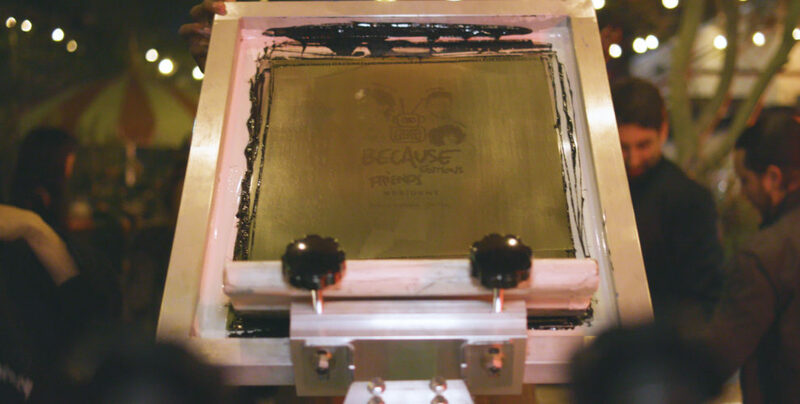 It’s simple – start live screen printing! My company Shirt Agency waited almost three years before offering live screen printing services for events, and the effects on our growth have been phenomenal. I only wish we had started sooner. Live printing engages your audience and strikes conversations with potential customers in an open and friendly atmosphere. Everybody deep down wants to make their own T-shirt, and setting up a live printing station transforms a simple giveaway tee into a story the partygoers are happy to share with friends. Below is our step-by-step guide to setup and manage live screen printing at parties and concerts. Beautiful blanks make you look good. Shirt Agency always prints on BELLA+CANVAS blanks when we head to events. The simple truth is that people like soft T-shirts with a stylish fit. Why go through the hassle of printing in front of an audience just to give them something that will end up never being worn? The 3001 Unisex Tee is a budget-friendly choice to give away, and you can be confident partygoers will wear it. Plus, the tight and smooth weave will make your printing look far better due to the decreased fiber fibrillation. Bring a wide selection of sizes to make sure everyone in attendance is satisfied. To keep costs down, I suggest limiting your offerings to a single style and color in most cases. Before you arrive, confirm that your station will have at least one electrical outlet capable powering the conveyor dryer. I prefer to give my team at least one hour of prep time before the doors open to properly set up our work area. Once you arrive, unload your gear. This is normally a two-person job due to the weight of the equipment. Lay down a tarp or carpet to ensure you do not cause any damage to the floor. Setup your individual screens, registering them to film and then add ink to run a few test prints. I like to have about 40 T-shirts pre-printed, just in case the line for apparel becomes too long. In my experience, the audience’s demand for T-shirts will come in waves. I always have one printer on press the entire event as well as one to three people grabbing the attendees’ correct sizes and putting each T-shirt into the print queue. Be prepared for a rush of people when the event first opens. People are most likely to talk to you at this time, because they are starting to get into the groove of the party but are not yet distracted by the band or friends. This is your opportunity to let them know how they can contact you in the future. I suggest you have a large stack of business cards at the ready. Also, if possible, set up signage with a hashtag or profile name, so that you are making the most of the event on social media. You may even want to run a promotion or additional giveaway to promote shares. I hope this quick guide helps you start your own live screen printing empire. If you would like information on having Shirt Agency print at one of your events head on over to ShirtAgency.com/live to learn more about our services and receive a price estimate.